“In 2002, archaeologists found an earthenware bowl containing the world’s oldest known noodles, measured to roughly 4000 years BP through radiocarbon dating, at the Lajia archaeological site along the Yellow River in China. The noodles were found well-preserved. They were described as resembling the traditional lamian noodle of China, which is made by “repeatedly pulling and stretching the dough by hand. The composition of the oldest noodles was studied by a team of Chinese researchers, who determined the noodles were made from foxtail millet and broomcorn millet. 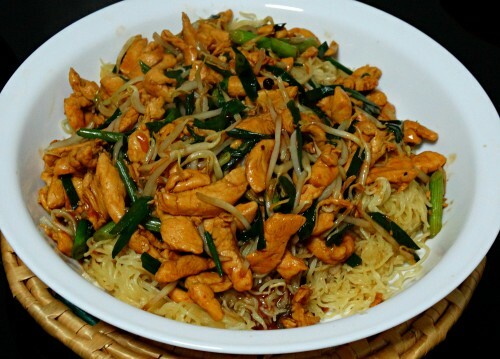 The earliest written record of noodles is found in a book dated to the Eastern Han period (25–220) of China.Noodles, often made from wheat dough, became a staple food for people of the Han Dynasty (206 BCE – 220 CE). In Tang Dynasty, the noodles were first cut into strips, and in Yuan Dynasty, the making of dried noodles began.” This was quite interesting! It’s impressive to note how people actually came up with the food that we so love and enjoy today! I’ve tried quite a few types of noodle dishes here at the food courts and restaurants and also when I travel. Starting from Bee Hoon, Hor Fun, Pad Thai, Mee Goreng, Laksa, Rice noodles, Glass noodles etc, I’ve tried almost all of them. But it’s still not the end. There are so many more dishes yet to try and every time I keep craving for more! It’s amazing how you can add ingredients of your style and taste and make it into a great noodle recipe. Even when I say that… I had a lot of trouble making noodles at home. It always became sticky and somehow I was never satisfied with the dish and so I was always scared to try them at home. So, when I was discussing the same with my colleague, she said “Oh! It’s very simple. I’ll teach you how to make the basic noodle dish at home.” I was totally excited hearing this and I came back home that day and tried the recipe. Since then, I’ve never been scared to try noodles…it has been fun always! I will post my noodle recipe learnt from her later. Ginger juice – 1 teaspoon (Grate around around 1/2 cup of young ginger. Mix with 2 tablespoons of water. 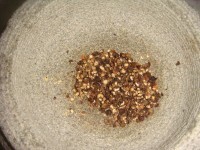 Strain the mixture through a fine sieve and you will have around 1/4 cup of Ginger juice. Step 1: Soak the noodles in warm water for around 10-15 minutes or until soft and then drain the water. 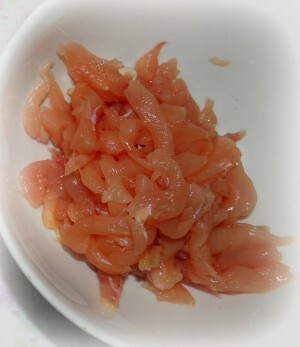 Step 2: Combine the marinade ingredients in one bowl and set aside. 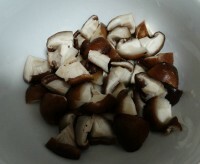 Combine the seasonings ingredients in a separate bowl and set aside. Step 3: Heat around 3 tablespoons of oil in a wok and add the noodles. Fry the noodles for very short time until they are golden grown and crisp (maybe for around a minute). 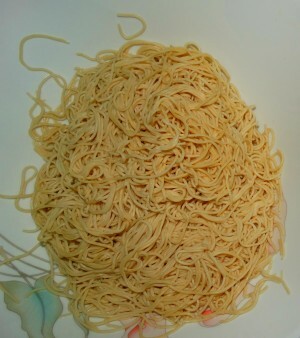 Remove the noodles immediately and place on a clean serving dish. Step 4: Add the remaining oil to the wok and stir fry the chicken along with the marinade mixture over high flame for another minute, until cooked. Step 5: Add the seasoning mixture, bean sprouts and green onion and continue to fry until the sauce thickens and you have the consistency you want. 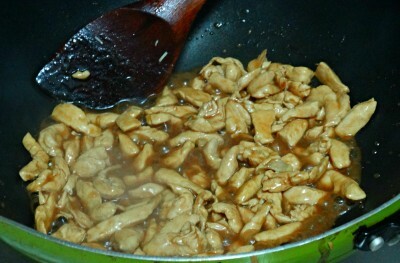 Turn off the flame and quickly pour the chicken mixture over the noodles. You can use any other meat or seafood instead of chicken. You can add other sauces and vegetables of your choice to make the dish suit your palate. 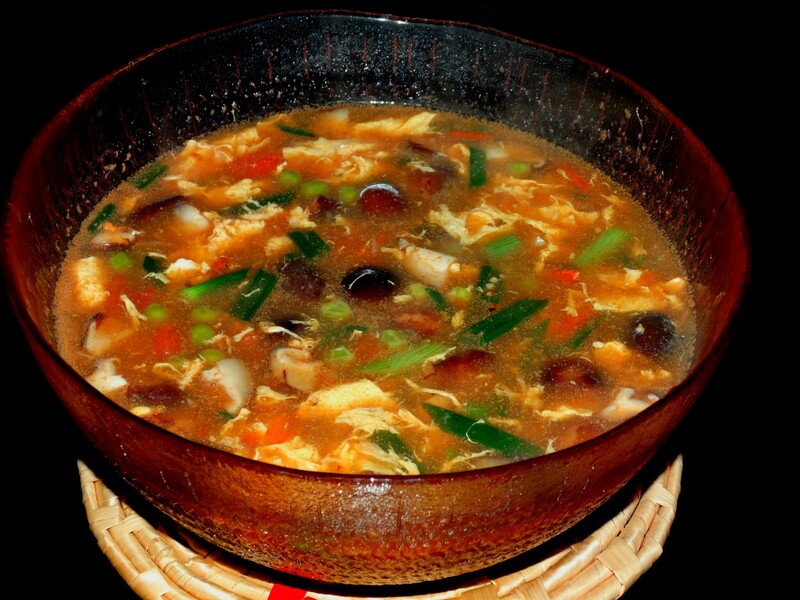 Hot and Sour Soup…an all time favorite! Chinese food, especially of the Sichuan province is something I always relish! The simple reason being of the hot and spicy flavor which appeals to my palate. I visited China sometime back and co-incidentally I happened to visit the Sichuan province. The food was just amazing, starting from the soup, to the noodles, stir-fried recipes. Specially, when I’m traveling, I make it a point to visit the small local restaurants because that’s where you get the most authentic flavors. Although the food was great, I did find a lot of difficulty trying to communicate with people there. I don’t know the language, but I had learnt some words and phrases from my colleague and was quite confident about it. However, when I spoke those to the people at the hotel, it seemed like Greek and Latin to them. It’s then I realized even though you know the words, the tone and pronunciation plays a big role when you speak. Every time I ordered, I had to call and point out the food which I wanted to have and do some actions to explain some customization required. I probably looked funny doing that, but I definitely didn’t mind as the effort made was worth it! 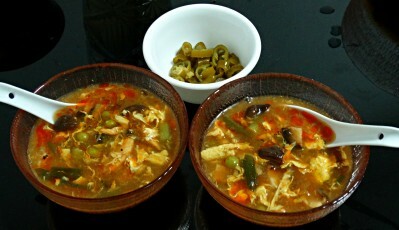 When I wanted to try Chinese food in my kitchen, hot and sour soup was the first thing which came to my mind. It’s an all time favorite… I used to have it always as a kid when visiting a Chinese restaurant. It’s a very simple recipe, using all the basic ingredients, except you’ll need some sauces…. 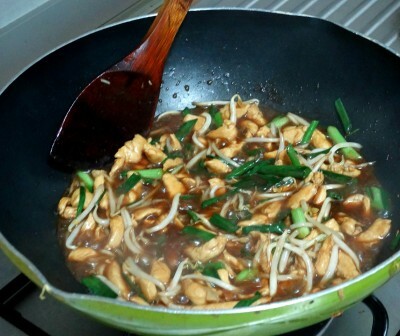 it’s a Chinese recipe, so it’s the magic of sauces after all! 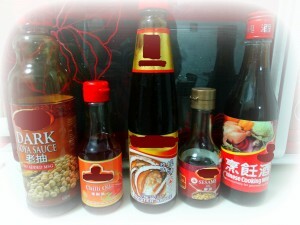 You can refrigerate the sauces for other Chinese recipes of your choice… I’ll be coming up with a few more soon. The soup is semi thick and could be a meal by itself. But I was in the mood yesterday. 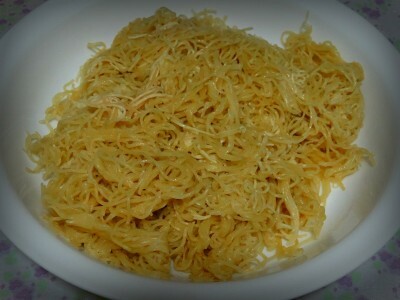 Hence, prepared some Chicken noodles as well.. which is the next recipe on my list. Step 1: Place the stock cubes with 4 cups of water in a pot and bring to boil. 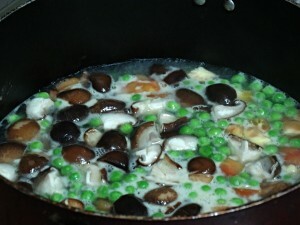 Add salt, sugar, ginger, peas, tomato, mushrooms and chicken and boil for around 4-5 minutes. Step 2: Add the sesame oil, pepper, soy sauce. Mix well. Slowly add the beaten egg into the soup. Do not stir for a min. Add in the cornflour/cornstarch mixture slowly, stirring gently. Heat for 1 more minute and add the green onions. Step 3: Add a few more drops of vinegar, as desired and chilli oil. Serve hot. 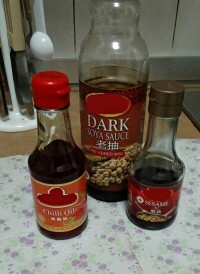 If you don’t have sesame oil, you can use normal oil too. 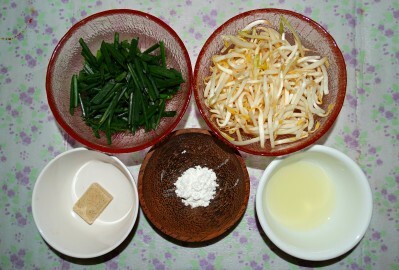 If a more thicker version is desired, you can add more vegetables like tofu, beans etc. Add some pickled chillies to the soup, if you like it very spicy. 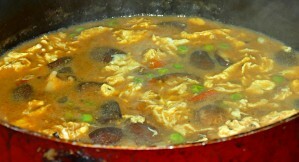 For a vegetarian option of this dish, replace chicken stock with vegetable stock and chicken with tofu or other vegetables, as desired.